Brightpearl will be your "master product list" so a product record is required for every product you sell whether it is available on all your sales channels or only some of them. In order for Brightpearl to manage eBay listings each listing needs to be connected to a product in Brightpearl. 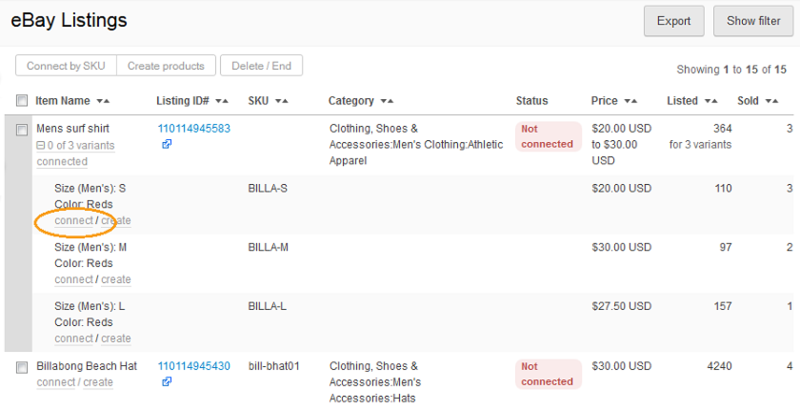 It is possible to edit, delete or disconnect a Brightpearl product which is currently connected to an eBay listing. Where a product exists in Brightpearl and is also listed on eBay, but it was not created from Brightpearl the product and the listing will need to be connected, this will allow the listing to be fully managed from within Brightpearl. 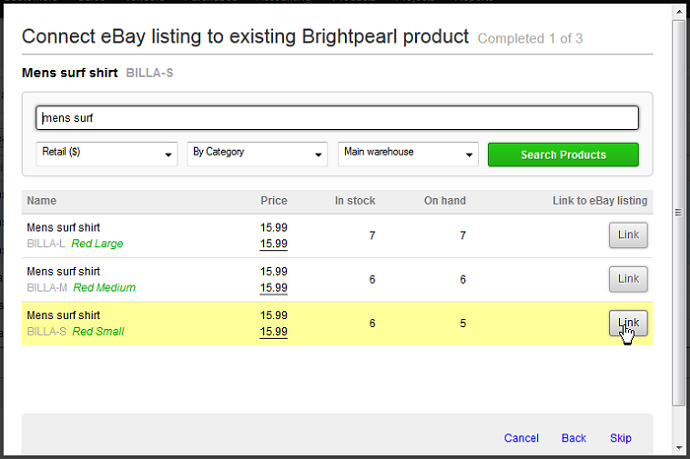 eBay listings can be connected one-by-one by searching for the relevant product in Brightpearl and linking them. 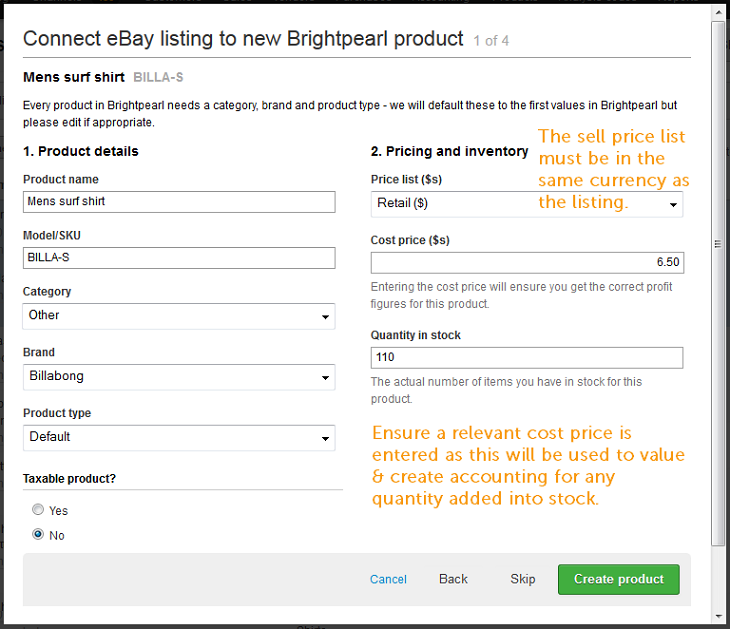 Once connected Brightpearl will update the eBay listing with the product SKU, price and availability based on the account setup. Where an existing Brightpearl product and an existing eBay listing have the same SKU (and it is unique across your products) they can be connected quickly and easily by matching SKU-to-SKU. If activated this can run automatically when the listing is first downloaded into Brightpearl. It can also be triggered manually. Read our white paper on "Understanding SKUs"
Note: Where an item has been actively listed internationally, it will need to be manually connected to a Brightpearl product. Brightpearl will auto-connect only listings made on the same eBay site as chosen on the eBay channel. If no product exists in Brightpearl it can be created using the listing. This can be done one-by-one or in batches for variants and international listings, but not for bundles. Go to Channels > eBay > Listings. Click the connect link below a listing to be connected. Search for the relevant product to connect. Note that the product will need to be connected to a price list of the same currency as the listing. A product will be listed multiple times where it has a price on more than one price list so it can be helpful to use the price list filter. Ensure that the product displaying the correct price list is linked to the listing. Note: When auto-connecting variant listings the first item will need to be connected manually, the rest of the group can then be linked automatically. Select the listings to be connected. Click the Connect by SKU button. The product must have a price on a price list which is set with the same currency as the eBay listing. If no relevant price has been set the product will not be displayed and cannot be connected. Where more than one price is set on multiple price lists of the matching currency the product will be listed multiple times. Link the product displayed with the appropriate price list, alternatively use the filters to search only a single price list. Items actively listed internationally cannot be connected SKU-to-SKU. Each one will have to be connected manually as a price list of the relevant currency must be selected for each. When auto-connecting variant listings the first item will need to be connected manually, the rest of the group can then be linked automatically. Select one or more listings to create products for - or click the Create link directly below the relevant listing. Click the Create products button. Product name - enter the product name as you wish it to display in Brightpearl. This will default to the listing name. Model/SKU - this will display the eBay listing SKU if defined. If no SKU exists on eBay one must be entered. If a new SKU is entered the eBay listing will be updated to match Brightpearl. Category - select the Brightpearl category the product should be assigned to. Brand - select the Brightpearl brand. Product type - select the Brightpearl product type. Taxable product (US)/Tax code (UK) - specify whether the product should be set as taxable in Brightpearl / assign the relevant tax code (UK). Quantity in stock - this will default to the current availability displayed on eBay. This figure will be used to add inventory into stock in Brightpearl. This will create an inventory accounting journal using the cost price entered above. Where more than listing was selected (batch create) use the Create product button to work through each item one after the other. If the process is cancelled half way through creating a batch of products, those that have already been created will be saved and connected. There's no need to connect the products afterwards, the connection is made at the same time. Where a listing comes with different variants (such as size or color) the option values will be automatically assigned to the product record in Brightpearl. Where the option values don't exist in Brightpearl they will be created. An eBay listing can be connected to a Brightpearl bundle. A bundle will need to be created directly in Brightpearl prior to connection. Although a bundle is non-stock tracked in Brightpearl a theoretical quantity can be uploaded from Brightpearl. Activate bundle quantities on the eBay account setup in Brightpearl. Products created from internationally listed items (actively listed) will be created as normal but must be assigned a price list in the same currency as the listing. If no price list of the same currency exists in Brightpearl the product cannot be created. Once a listing has ended it will continue to display in Brightpearl under your "Ended listings" tab. An ended listing can be relisted at any time. Go to Channels > eBay > eBay Listings. Select the Ended Listings tab. Use the filters to locate one or more listings to be relisted. Select each listing to be relisted. Click the Relist button at the top of the report. If the item is relisted from eBay you must ensure that it is re-connected to the product in Brightpearl. If "Auto-connect by SKU" is active for the account this will happen automatically where the SKUs match, otherwise it must be done manually. When using the relist function, the price list used will be the one selected for your eBay channel in Settings > Brightpearl Apps > eBay. It is recommended to set up a designated eBay price list to be used with this channel via Settings > Products/Inventory > Price lists, and ensure all of your eBay products have an amount entered for this price list. If the SKU is changed on the Brightpearl product it will update the eBay listing. If other Brightpearl product details are updated, this will not affect the eBay listing. If the Brightpearl product is disconnected from the eBay listing the listing will remain active and it will still be visible on the eBay listings screen in Brightpearl where it can be reconnected to a new product. Note that whilst the listing is not connected to a product orders can still download but will not assign or allocate the product. If the Brightpearl product which is connected to an eBay listing is deleted the listing will remain active and it will still be visible on the eBay listings screen in Brightpearl where is can be reconnected to a new product. Note that Brightpearl products can only be deleted if they have not been used and therefore have no transactions related with them.